I need to match a word to a list of words and then insert the category name in the cell next to it. Eg. 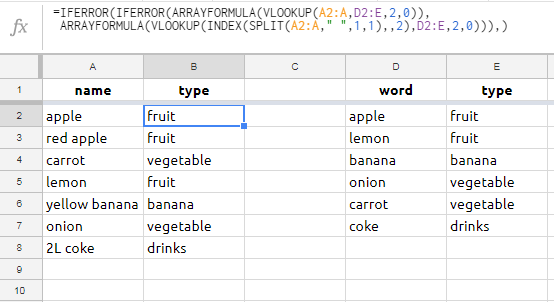 I will in Column A type a list of words like Apple, Red Apple, Coke, Carrot The formula must then find the word (or part of the word) in a List Column D and the place the Category in cell B next to the word. Formatting a cell with word wrap without switching modes?